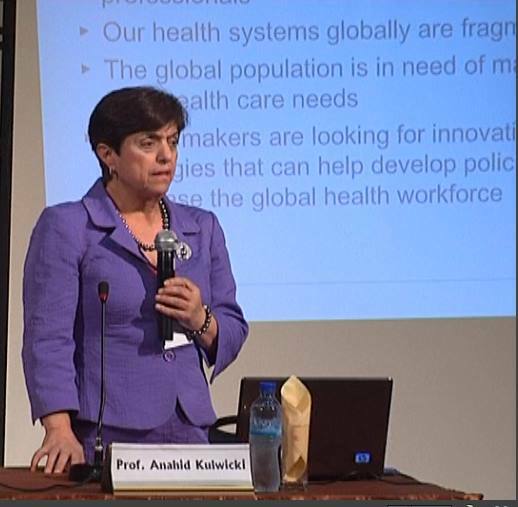 The Faculty of Health Professions at Al-Quds University and RECA invited Professor Anahid Kulwicki, Dean of the College of Nursing and Health Professions at the University of Massachusetts - Boston in the USA, to be a key note speaker at a conference entitled "Towards Promoting and Developing Quality Health Care." The conference was held in November 16, 2013 in Jerusalem campus of the university. At the conference, Dr. Kulwicki presented a lecture on" Improving the quality and access to comprehensive health care through inter-professional practice". Dean Kulwicki met with members of the faculty in the Department of Nursing and Midwifery to discuss their programs and its needs. Dr.Kulwicki commented that "the Department is doing impressive, high quality work." She and RECA President Anan Fareed also met with Al-Quds University President Dr. Sari Nusseibeh, Vice President Dr. Imad Abu Kishk, and with Dr. Kholoud Aldajani to discuss cooperation in the fields of Nursing at Al-Quds University and the University of Massachusetts Boston university. Dr. Kulwicki's visit was organized and sponsored by the Research and Education Collaborative with Al-Quds University (RECA) in cooperation with Dr. Mahmoud Srour, President of the Conference of the Palestinian Health Sciences. 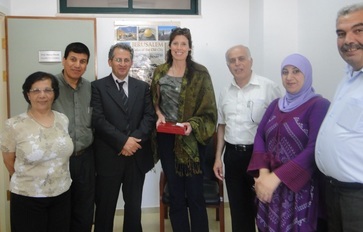 We greatly thank RECA's support of the education exchange between UMass Boston and Al-Quds University. We would all benefit from the collaborative work that RECA supports. "During my fall semester sabbatical in 2013 I had a Fulbright Specialist Grant and was fortunate enough to spend 5 weeks working at Al Quds University. A representative from RECA put me in contact with the School of Public Health, where I worked for the 5 week grant period. I was a guest lecturer, gave 2 public seminars on qualitative research in nutrition and sports nutritional supplements, and helped the department work on their public health nutrition curriculum. I was also a keynote speaker at the Palestinian Conference on Health Sciences: Towards promoting and developing a quality-health care, Faculty of Health Professions. My presentation was: Obesity: Geographic distribution, and food policy. I can't emphasize enough how much I appreciated this opportunity. Thanks to RECA I had a great experience and made some nice friends during my time in Abu Deis." "I am so appreciative to RECA for supporting the 2nd Annual Public Health Conference April 2013 at Al Quds University, which I actively participated in the conference by representing Tufts University School of Dental Medicine as a speaker at the opening session. I was given the opportunity to visit Al Quds and be exposed to the high quality informative research conducted at the University. Over the next several days I visited clinics and classrooms and met with students and administrative leaders at the School of Public Health and the Dental School. The talent, determination and pride at Al Quds was so refreshing. We discussed our collaboration for research and education. The personal connection with my hosts and their hospitality was amazing. A special thanks to Anan Fareed, Founder and President of RECA, for making this possible." "I am very grateful to RECA for coordinating my visit to Al-Quds University in October 2012. The social work program is aiming to develop greater strength in clinical training, and I taught a series of daylong workshops on case study methodology. I also taught a course on psychosocial assessment in the graduate psychology program. I was extremely impressed by the students in both departments—their motivation and engagement, and conscientious critical thinking about difficult and complex psychosocial problems. I was particularly struck by their seriousness about our work together, as well as the dedication and perseverance of the teaching faculty I encountered. I returned home feeling inspired about the potential for higher education, and also thinking about teaching strategies I learned from new colleagues. I look forward to building on this collaboration with RECA in teaching and research to benefit and support all of our students in the years to come." "In February of 2012, RECA provided me with the opportunity to spend two weeks at Al Quds University. While there, I delivered a series of workshops on group and organizational behavior to students and faculty in different departments in the Faculties of Health Professions, Public Health, Medicine, and Social Work, as well as the Center for Gender Studies. It was inspiring and a pleasure to work with so many students and faculty who are committed to learning and to providing excellent health care in an uncertain and stressful environment. My hosts (particularly in the nursing department where I spent the majority of my time) were exceedingly warm and generous with their time both within and outside the classroom. I am grateful to RECA for providing me with such a rich learning experience. RECA can play an important role in facilitating exchanges between Al Quds and American Universities for mutual benefit in developing academic programs and expertise. I am looking forward to further collaboration with RECA and Al Quds University." "I had the pleasure of meeting with members of the Al-Quds faculty and administration in 2010. As an outsider - an American Jewish woman - I felt extremely welcome and comfortable. I learned about the strengths and potential of several programs and about the frustrating lack of resources to fully implement these. In addition, I met with a group of undergraduate social work students at Al-Quds University I was delighted by the rapt attention and important questions that they raised through the interpreter. They expressed their concerns about how hard it is to work with families with so many problems and they were all very aware of the shortage of personnel to meet the needs of their clientele. I do believe that RECA can play a significant part in supporting the work of Al-Quds by helping to build its financial resources and by consulting with the university on ways to expand its influence in many fields of study. We would all benefit from the research and academic expertise that Al-Quds can offer, and I would like to see more exchange programs between Al-Quds and other universities in the middle east and abroad. " "My sincere thanks to RECA for the magnificent opportunity to visit and teach at the School of Dentistry of Al-Quds University in the early part of 2010. I spent a month leading workshops, seminars and lectures on a variety of topics related to dentistry and orthodontics. It was wonderful to travel to Jerusalem and work with the intelligent and talented students and faculty of Al-Quds University. The dean Dr. Mohammad Abu-Younis eagerly expressed his collaborative and encompassing vision for the dental program and his desire to improve resources for the students and faculty. In my work in the Boston area and Cambridge, I teach dentistry students at Harvard University and also practice out of my own clinic. It was a pleasure to share my professional experience in adult and adolescent treatment, especially in the areas of clinical examination, photographic analysis, diagnosis of orthodontic problems (including Invisalign and other plastic correctors), and dento-orofacial examination. I hope that my workshops added to the already rich offerings within the dental program at Al-Quds. I am thankful to RECA for arranging this visit and contributing to my own professional development. I am committed to supporting the growth of the dental program at Al-Quds having seen the great potential there, and I look forward to the possibility of continuing to lead workshops at Al-Quds University in the future. " "During May of 2010, I had the wonderful opportunity to teach at Al -Quds University in a visit coordinated through RECA. I spent three days at Al -Quds providing research workshops and collaborating with faculty and students in the Department of Nursing. My program was organized by Dr. Rasmi Abu-Helu, Dean, Faculty of Health Professionals whose vision for the department was quite inspiring. Al Quds University is a vibrant hub of learning. I found the nursing faculty and students to be thoroughly engaging and committed to advancing health for the Palestinian people. The campus is lovely and the staff and students were warm and welcoming, truly a pleasure to work with. I am so grateful to RECA for making this experience possible."